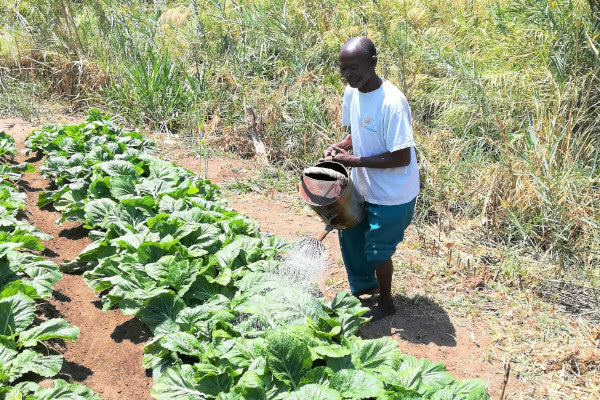 A husband waters the crops in the women’s health group’s garden. A community group member tending to crops in his local community garden. The garden is a great source of income - the group have been able to purchase 30 new chicks to rear, and they sell their produce to the wider community. This garden is a sustainable source of support for everyone, and even provides pregnant women with free vegetables. Members of the Obanga Atwero village community group, Oyam, Northern Uganda. One of our Oyam district community groups, standing together at a meeting. Men and women both take part in the groups, with the women leading the discussions. Both men and women take an active role in finding solutions to the issues mothers face during pregnancy and childbirth. The group attendees vary in age, with many children, as well as older women attending. Older women also play a key role in the groups, as caregivers for the children and advising new mothers. 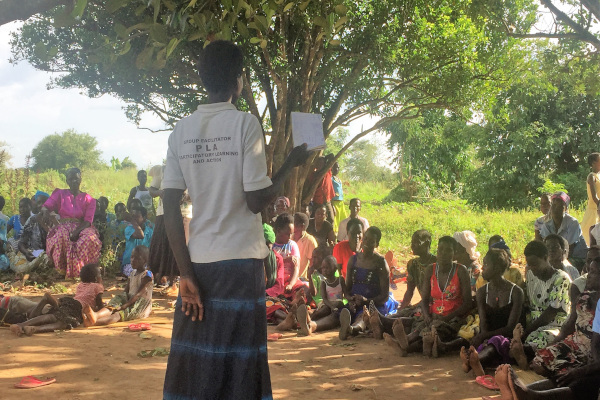 A women’s health group meeting, where members are learning about malaria, in Oyam, Uganda. A women’s health group leader uses picture cards to aid a discussion on malaria prevention in her local community, Oyam, Northern Uganda. This group identified malaria as a particularly large problem, and aim to come up with sustainable ways they can take to prevent getting infected. A community group meeting, taking place close to a local health centre in Salima District, Malawi. A group of at least 30 women and men discussed the importance of HIV testing amongst partners. Two of the group members put on a play, which was followed on by a discussion of what problems the characters faced and how they overcame these problems. Three happy mothers posing outside their community group meeting with a brand new member! Women’s health group members Finja (left), Gladdis and her baby (middle) and Eliza, (right). One of the most important things these young mothers learnt from the group was to go for antenatal care much earlier during their pregnancy. Gladdis mentioned that previously she would only attend antenatal care when she was six months pregnant - with this pregnancy she started going as early as two months. All three mothers say that they’ve felt much healthier and supported in these pregnancies than their last ones. Two community group leaders in Oyam. This team have supported their groups in helping to identify key health issues; such as malaria, and sustainable ways in which the risk of catching the illness can be reduced. The groups that these two leaders help to run often have up to 60 attendees per meeting. Group members performing their play about using bed nets to safely prevent catching malaria. Obanga Atwero village group members perform a short play about the importance of sleeping under bed nets correctly, in Oyam, Uganda. This creative process has engaged the group in discussions about Malaria prevention. The play explains how not sleeping under a bed net is likely to put them at risk of illness from mosquito bites, and shows how to sleep under one properly. Health group members stand outside their garden, where they are farming food for the community. Community Group members standing in their local garden, near Chitala Health centre in Malawi. The members and their religious leaders have come together to support the garden - and one another - in many ways, including rearing chickens, generating income from the produce, and lending tools. Women’s health group leader in Chitala, Malawi, with some of the attendees. A community group leader with some of her members. She has been supporting this group for the last two years, helping them discuss problems they face during pregnancy and childbirth, finding answers to these issues, and implementing them to great success. She is passionate about the sustainability of the groups, saying that they would continue “no matter what”. Janet and her baby are pictured at their local women’s health group meeting; where, since coming, Janet has found support and learned the importance of immunisation for her two children.